Almost all of us will have at least one pair of patent leather shoes or bag. This glossy shiny leather is regular leather coated with lacquer. This special finish requires different care than regular non-patent leather. There are 4 household items that can be used for patent leather care. Please do NOT use these products on other types of materials or leathers. They are strictly intended for patent leather. As with all tutorials, use caution and test a very small area first. Cleaning - When a paper towel dampened with water doesn't work in polishing your patent leather item, try Windex sprayed onto a paper towel. Windex helps in removing stubborn dust and smudging. Discoloration - While patent leather is more resistant against tears and cuts and stains from liquids than regular leather, it is more prone to color transfer through scratching and scuffing. So when patent leather is flawed, it is usually due to color transfer. Petroleum jelly, isopropyl alcohol and nail polish remover with acetone can help with discoloration. You will want to try petroleum jelly on a paper towel or q-tip first. If this does not work, try the isopropyl alcohol. Based on our experience, patent leather can withstand moderate amounts of pressure using alcohol on a paper towel or q-tip. We have not experienced any shine loss with using isopropyl alcohol. If both the petroleum jelly and isopropyl alcohol do not work, that means the stain has been absorbed into the lacquer. Try the much stronger and harsher nail polish remover with acetone. Wet the q-tip in nail polish remover. With very light pressure, move the tip in small circular motions on the discoloration spots. Then, using a dry clean q-tip end, move the tip in small circular motions around the same area. If the discoloration fades, repeat until the discoloration is gone. Be very careful with the nail polish remover. This substance can remove shine to your patent leather if not used in a careful judicious way. Here is an example of a significant scuff that was removed by using isopropyl alcohol. We went over the affected area several times with moderate pressure until the discoloration was completely gone. While many discolorations can be removed using 1 of the 3 products, some scuffs and stains are much more stubborn. 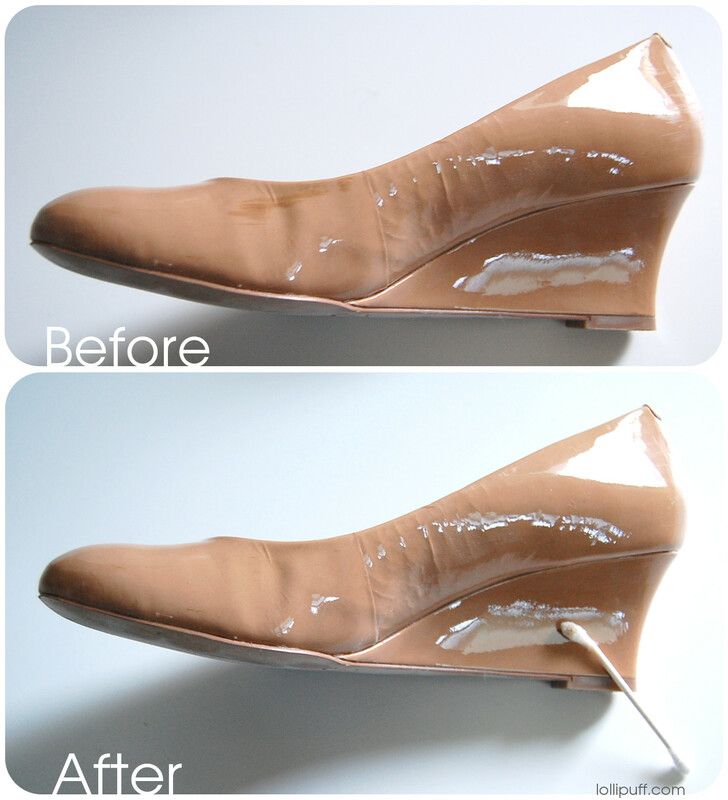 An experienced cobbler or handbag specialist can dye a light-colored patent leather darker. Patent leather can be affected by its storage. If stored improperly, this is when most of the damage occurs. Extended time where the leather is pressed up against another leather or plastic can cause color transfer. Also, extended long-term exposure to sunlight can cause irreversible color fading. So, proper storage is an essential step to the care of patent leather goods. Dustbags - A dustbag or tissue paper can protect your valuable patent leather shoes and bags from over-exposure to moisture and sunlight. If you don't have a dustbag for your item, simply use a white cotton pillow case or check out this DIY dustbag tutorial. 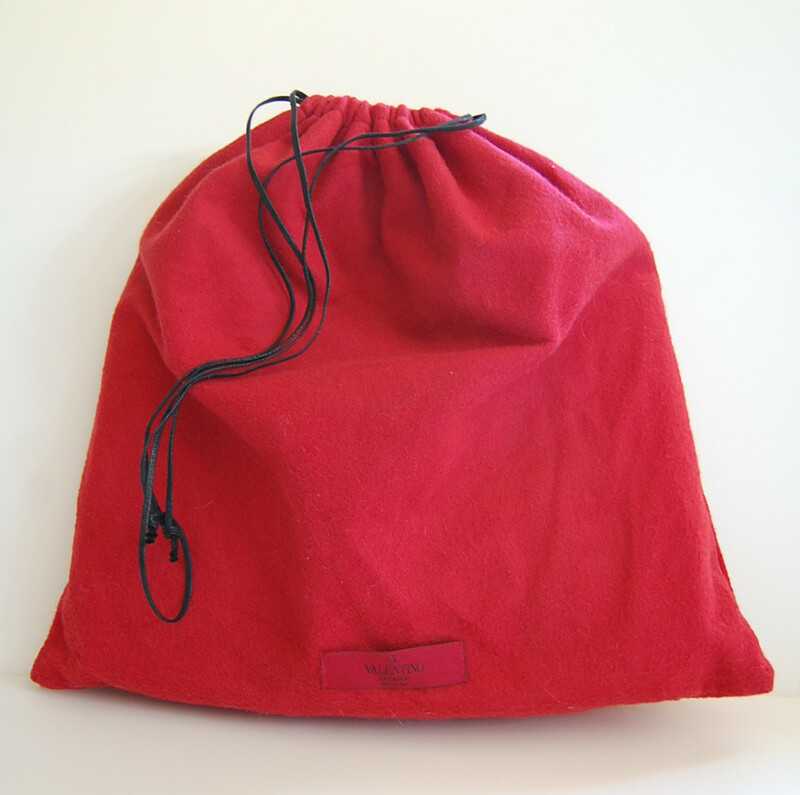 Stand upright - Slightly stuff your bag with some clothing or tissue paper and stand it upright in your dustbag. This will help the bag keep its form. Do not place it in a spot where it withstands pressure from other items. Want fun fashion and the best deals on designer items?